In 2014, the Borexino collaboration published (Nature 512, pp 383 2014) the first real-time measurement of neutrinos from the proton-proton fusion process. In the core of the Sun, energy is released through sequences of nuclear reactions that convert hydrogen into helium. The primary reaction is thought to be the fusion of two protons with the emission of a low-energy neutrino. These so-called pp neutrinos constitute nearly the entirety of the solar neutrino flux, vastly outnumbering those emitted in the reactions that follow. Although solar neutrinos from secondary processes have been observed, proving the nuclear origin of the Sun’s energy and contributing to the discovery of neutrino oscillations, those from proton–proton fusion have hitherto eluded direct detection. 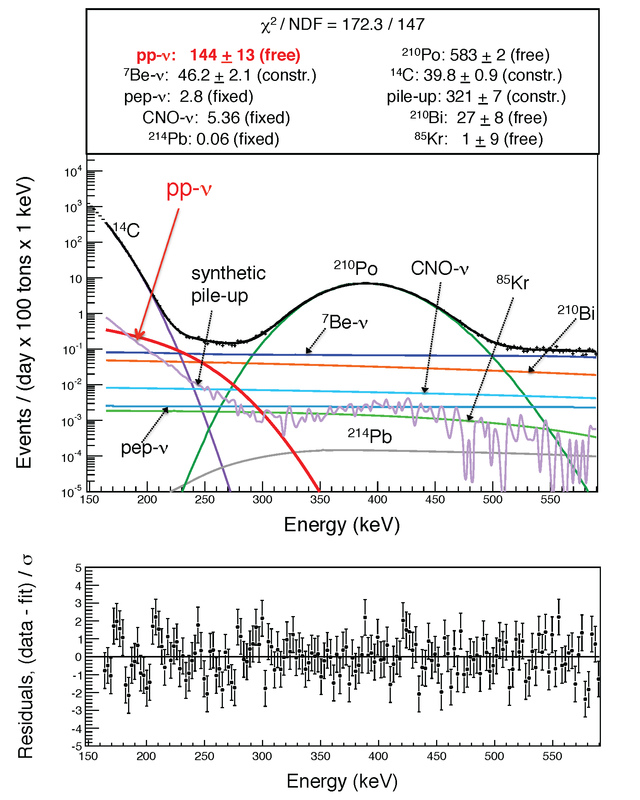 Here we report spectral observations of pp neutrinos, demonstrating that about 99% of the power of the Sun, 3.84 × 1033 ergs per second, is generated by the proton–proton fusion process. This plot (as given in Fig. 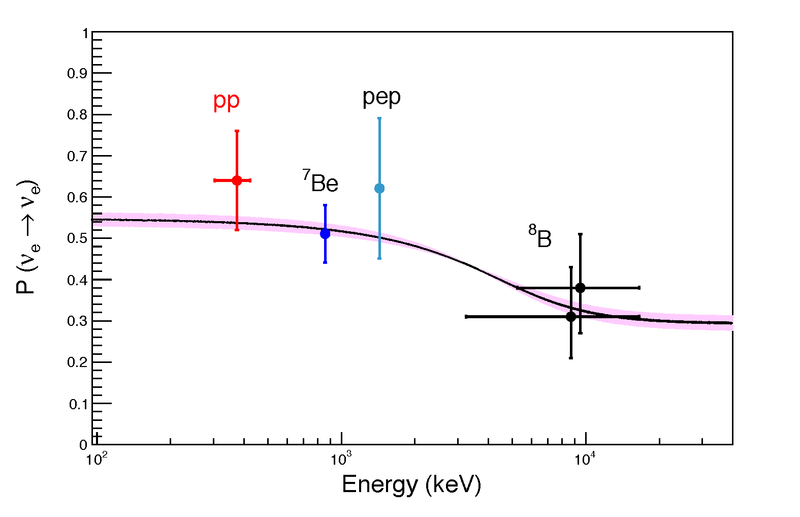 3 of the Borexino Nature paper) reports the fit of the Borexino energy spectrum between 165 and 590 keV and the relative residuals. The properties of the data bins and residuals are available here. This plot, as shown in “Extended Data Figure 2″ of the Borexino Nature paper, reports the ± 1 prediction of the MSW-LMA solution for the electron survival probability as well as the survival probability points associated to the Borexino experimental measurements of pp, 7Be, pep and 8B solar neutrino flux. Numerical values for the electron survival probability band are available here while the coordinates of the experimental Borexino measurements can be found here.